The code would be more clear if you had used Dictionary<> instead of listItem. In addicition you could create a helper method to return HTML code to render the control. Rony - Thanks for the response. You can't use a Dictionary because internally the Dictionary keeps it's own order based on the hashing algorithm. The ListItem keeps the correct order. For the helper method, the "fillSelect()" is the helper method. Unless you were talking about a server side method that renders the client side jQuery code. If so, that's an interesting idea. I guess this would have to take several parameters though: a control which initiates the ajax request, the controller, the action, and the target dropdown control to fill. Great example. It really shows off what can be done with Jquery, MVC and Json. In real life I believe that the Ajax and Json is not going to be used for inital load of the page. I think an ordinary View would be less code. Once the page is loaded if you have dynamic parts of your page then the Jquery-Ajax and Json are going to come into play. A search page where the critera was at the top and the resluts at the bottom would be a good case for Jquery-Ajax Jason. A photo gallery with star rating for each picture. As user press star JQuery-Ajax updates db via json. A shoping cart would be another canidate for JQuery-Ajax. Pete - thanks for the comment and those are all good examples. However, I think we're going to see more and more uses for AJAX even on the initial page load. It's often said that a singe-page web app is the "holy grail" for a pure ajax developer. If you look at sites like PageFlakes (http://www.pageflakes.com/) you'll see that *everything* is AJAX including the initial load. 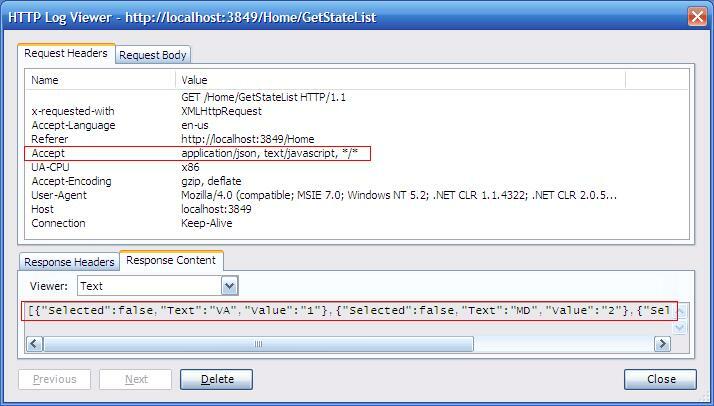 Tom - You can get JSON with the MicrosoftAjax.js by using the Sys.Net.WebRequest invoke Method - the documentation can be found here: http://www.asp.net/AJAX/Documentation/Live/ClientReference/Sys.Net/WebRequestClass/WebRequestInvokeMethod.aspx. Sweet stuff. Really liking the combination of jQuery, JSON, and MVC. I still can't believe it's coming from Microsoft because it's... timely and trendy. Thanks for the example - I didn't know about ListItem and was previously passing generic lists. Great post! I found this immensely useful. This works really well in the Action, particularly when your type is more complex than what is required to populate a drop down list. I find the answer I want. Thx. What about if we need to return a cross-domain JsonP? Great Post. Imagine how responsive an application can be if it is pure AJAX with JQuery calls. MVC application + homecontroler.cs + create.aspx + in asp.net page, i m using some html and asp.net controls (button,gridview).Now i want visibilty of gridview control is visible false and when i m click of button the visibilty of gridview must be true.what code i have to use for this with java script. MVC application + in asp.net page, i m using some html and asp.net controls (button,gridview).Now i want visibilty of gridview control is visible false and when i m click of button the visibilty of gridview must be true.what code i have to use for this with java script. @Binal - You are not meant to use ASP.NET server controls (like the grid view) in an MVC application. You should ensure that your <form> tag does *not* have a runat="server" attribute in it. Seems like the basic idea being explored here could be librarized along side the other HTML input controls and we could have a self-generating, self-documenting CRUD to serve as front end to the db. Nice. Never thought it would be quite that easy! dude, stop saying everything is "easy". I'm sure it took you some time to figure this all out. I hate posters who say it's all easy when it's not. Even if jQuery makes it "eaiser" you sill have to understand the ins and outs of jQuery and learn how to parse through, etc. @congcong - a DataSet is not a good candidate for a structure to be serialized to Json. I would put the contents of the DataSet into a SelectList before sending across the wire. but it gives error. If i set temp = "microsft" only, it works. So long string it is breaking. what can be issue? But I am facing a problem. When I click on, submit button, controller's method is called and return json result. But my callback functions are not fired or called. So I m unable to fill my dropdown list. Those functions have to be defined *first* before they are called. My guess is that might be what you're running into. Also, you can download the sample code from the link in the post above and ensure that is running successfully for you. I do all the step that you mentioned in above but it's not work and i also download your soft codes too for testing but it's still not work, how can i do? can u tell me because i need to know it's very much. Great post. Worked like charm! I am bit confuse. Is this a AJAX call? Because for AJAX call in jquery we should use $.ajax is it? I noticed the Selected field in the JSON data. Did you omit this in the other code? @Derek - That post is very old and was using a beta release of MVC back in summery 2008. Use SelectListItem instead of ListItem. Your example, while nicely laid out, doesn't work for me. I replaced the ListItem with SelectedListItem, Json is still not valild and getJSON doesn't fire....please update this tutorial to avoid confusing people. thanks! Thanks for the code. That's really useful for a project I'm working on with this muay thai website. great post: really works for me. I just added one more line to "$.fn.fillSelect" to set MD state as default option.